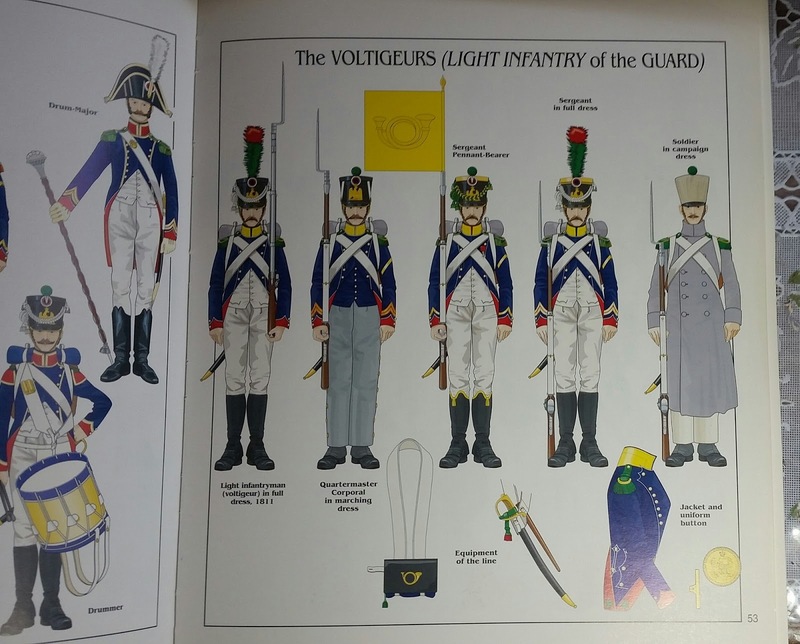 Here are a unit each of Fusilier-Grenadiers, Fusilier-Chasseurs and Voltigeurs of the Imperial Guard as they may have appeared while participating in the Peninsular War. After the Minwax staining, a bit of highlighting was added - particularly on the edges of the clothing. 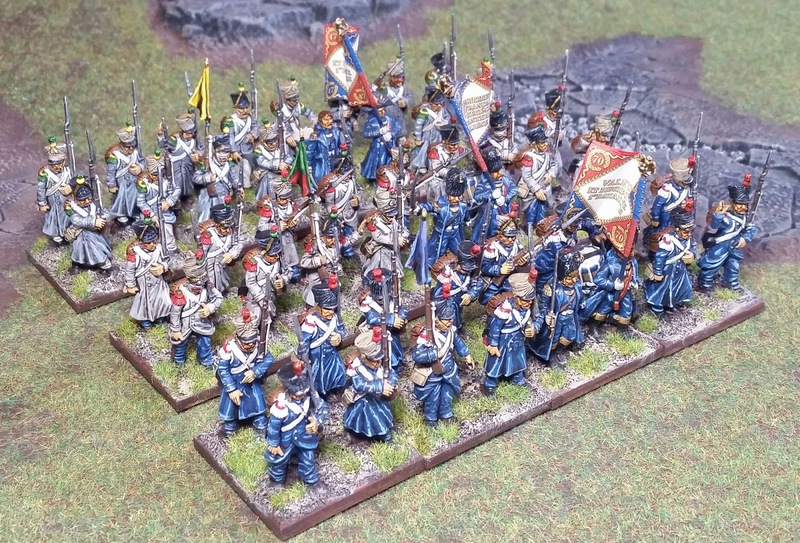 I was pleased to find a few flags from a previous box of Victrix French from years ago. This particular set didn't come with flags. 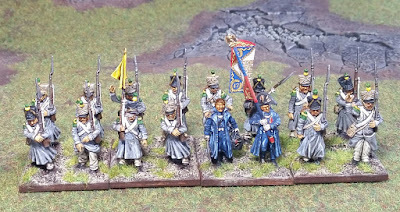 Granted the numerals on the flags don't correspond to the units, but at arm's length you really can't make them out. 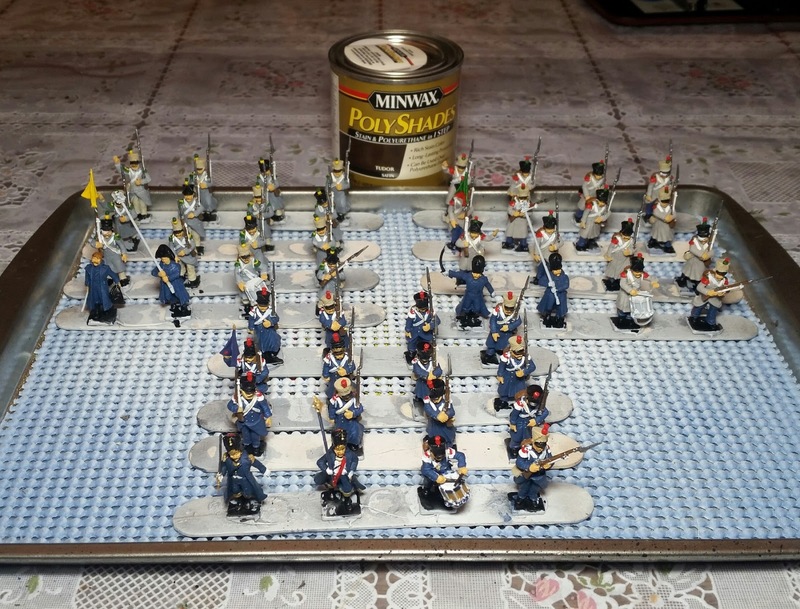 With four bases, the units can be formed into Attack Column or Square, as well as Line and March Column. 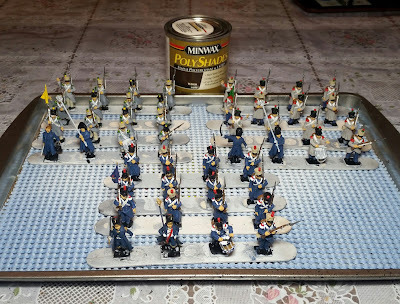 As mentioned in the previous post, this set comes with 60 figures, so there are 12 remaining figures which I haven't decided how to paint up. 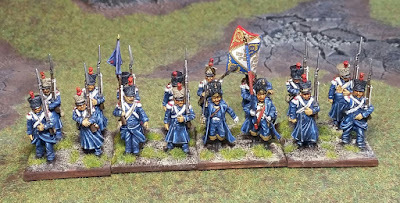 In the meanwhile, I will start on the box of Perry British Line Infantry. Thanks for stopping by and best wishes to all! So managed to finish up the remaining figures with block painting and gave them a brush on wash of Minwax Tudor Satin stain. 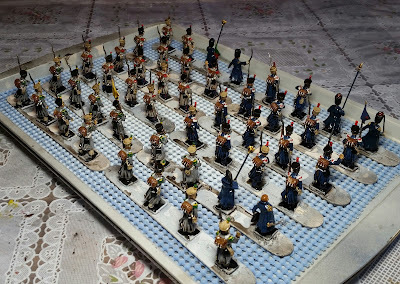 I tried to dab off excess pooling at the bottom of the figures - particularly the edges of the greatcoats. Once they're completely dried they'll be sprayed with Testors Dullcote. After the Dullcote, some highlighting and touching up will be done. 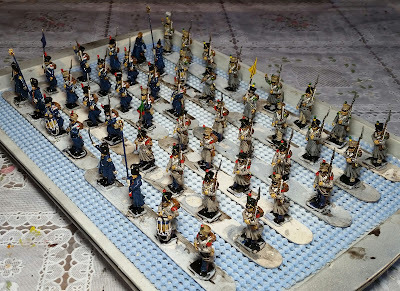 As they'll be based in close formation, 4 figures per 40mm squares - a lot of minor imperfections will not be readily visible. 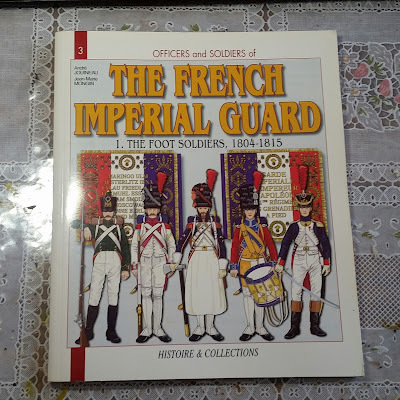 There are 12 remaining figures from this set, and I may add them to the 4 "extra" Perry French Light Infantry figures I have once I break that unit down to 16-man units. Anyway, I'm happy to have come this far on this project. Best to all. Just a quick update to let you know I haven't flaked out on this project. Although the sloppy block painting may seem a bit flaky. Fear not though, I picked up a new can of Minwax Tudor Satin stain which will, hopefully, disguise a lot of the flakiness. Also, highlighting should enhance the overall look. Besides these are strictly gaming figues, by George. Anyway, here they are - I managed to just about finish the block painting of the Fusilier-Grenadiers (in front). The remaining two units of one each, Fusilier-Chasseurs and Voltiguers just need a few finishing touches - namely the command groups. I'm not really happy with the dark blue, but highlighting will hopefully fix this. I mixed some black and a little red with the Game Color Ultramarine Blue that I have from the set I picked up from ebay last year. I much rather use a basic blue, but too lazy to pick up another bottle. 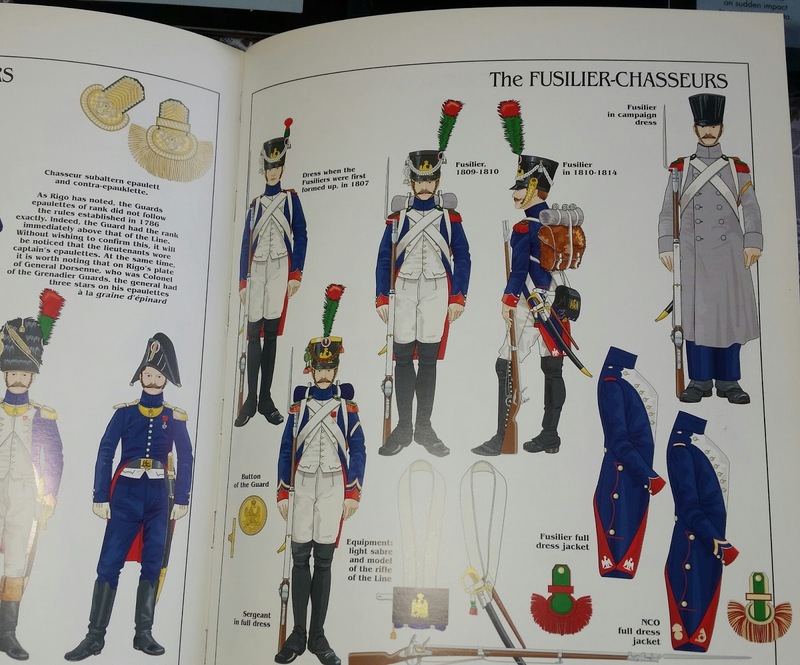 The Fusilier-Chasseurs in the foreground. I jazzed up their trousers with red stripes. Not sure how historically accurate this is, but like the look. 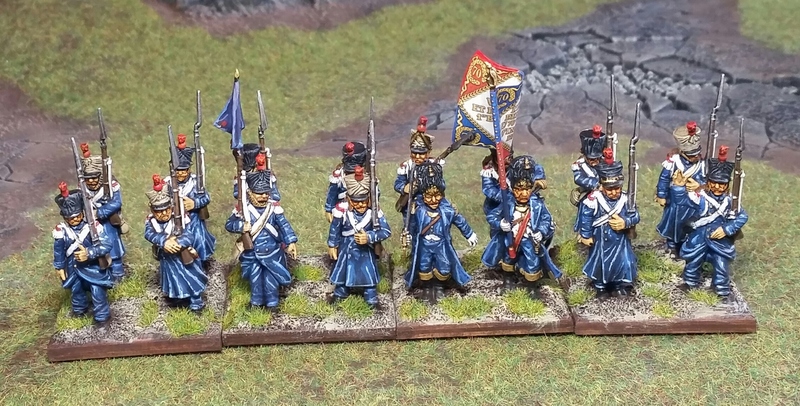 The backpacks are a easy to paint up with the greatcoats not on top. 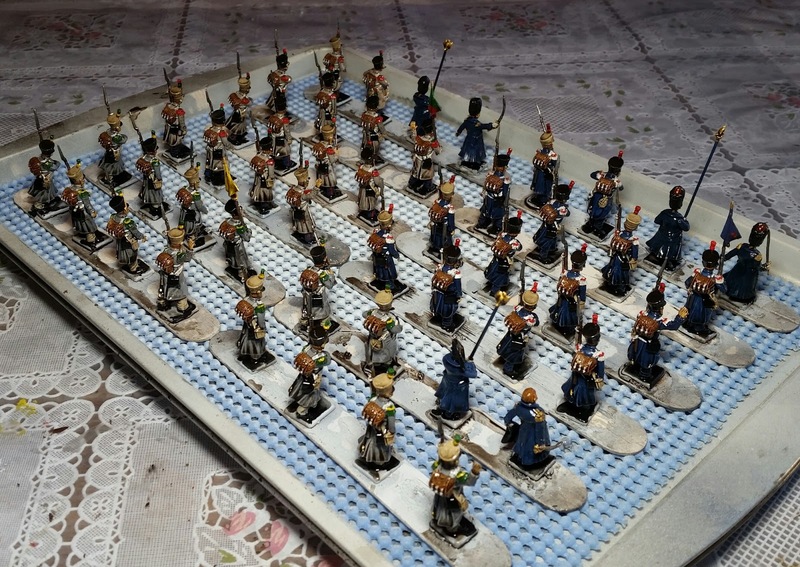 This kit has the sword and bayonet scabbard molded on the bodies, which not only speeds up putting the figures together, but makes them very durable for gaming. Well, time to take a break and watch some dumb videos on YouTube. Thanks for stopping by and best regards. 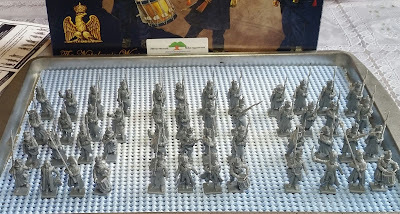 Managed to put together 48 of the 60 figures; grouped into 3 16-figure units. 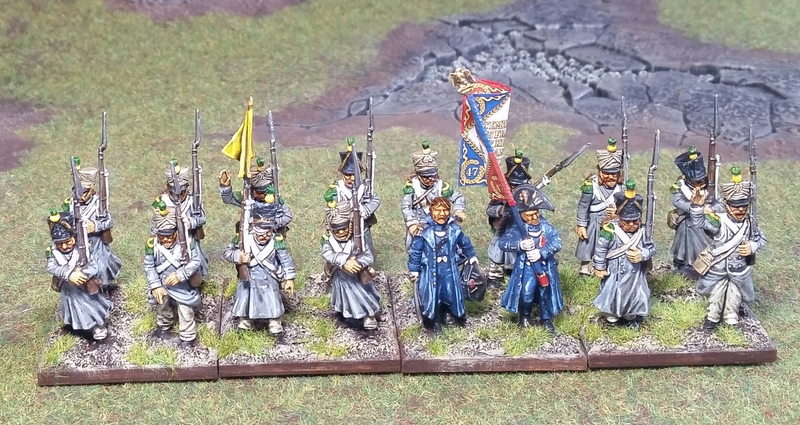 I used some of the Grenadier and Chasseur bearskins for officers. I plan to paint the units up as Fusilier-Grenadiers, Fusilier-Chasseurs and Voltigeurs of the Guard. This set has far less separate parts than the previous Victrix sets, and the plastic seems to be a lot more durable. Hopefully, they'll paint up pretty easily too, as they're wearing greatcoats (the backpacks reflect this too). Images from a nice uniform book which will be used as a painting guide. Next, the figures will be glue-gunned to popsicle sticks - may have to make a run to Joann's to pick up more sticks. Thanks again for stopping by. Finished the re-basing of French and British cavalry, as well as a few French Voltigeurs. 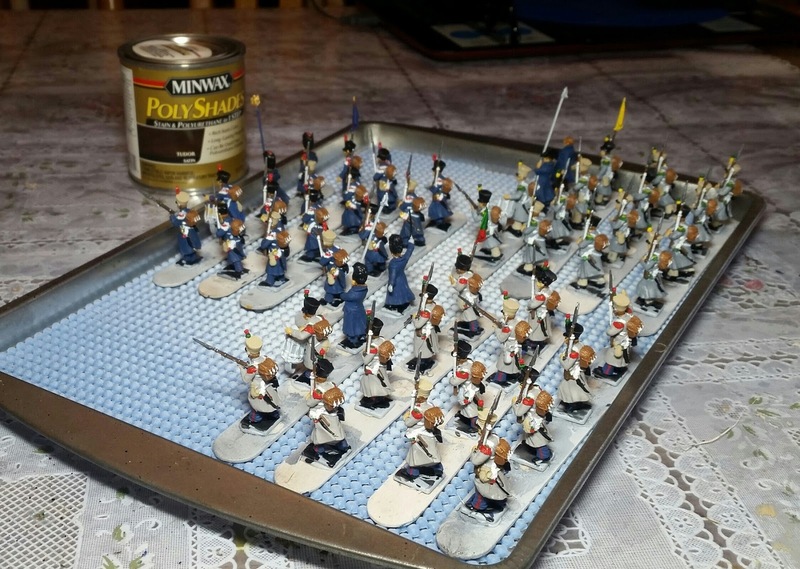 I also got a box each of Victrix Middle Guard and Perry British Line Infantry. Just to affirm how small a world our hobby is, I unwittingly won the two boxes off of ebay from an old acquaintance, Phil Vernon, whom I had met in England back in 2013. This was when I was fortunate enough to tag along with my buddy Pat L. (aka Socal Warhammer) to attend the WAB GT. Me, Pat and Phil drove around after the tournament and visited Nottingham Castle (which was closed) and also the Wargames Foundry. Phil moves around between England and the US, and the address where I won the boxes were from his Stateside address. I'm revisiting Black Powder, which I hadn't touched since early 2012. Re-reading the rules, they really seem like a decent convention set of rules, and am looking forward to hosting some games again. 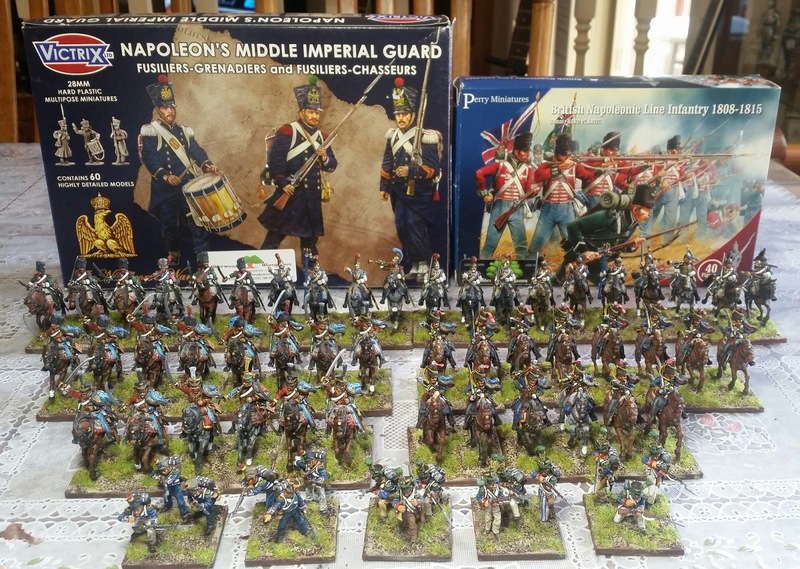 Which is why I ended up replenishing my troops, having sold off over half of my Napoleonics. 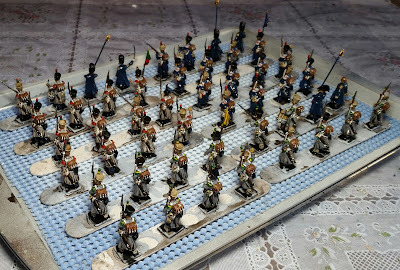 Since I don't intend to play on anything larger than an 8'X6' table, I decided to scale down standard sized units to 16 foot troops - 4 stands of 4 figures, and 6 cavalry. 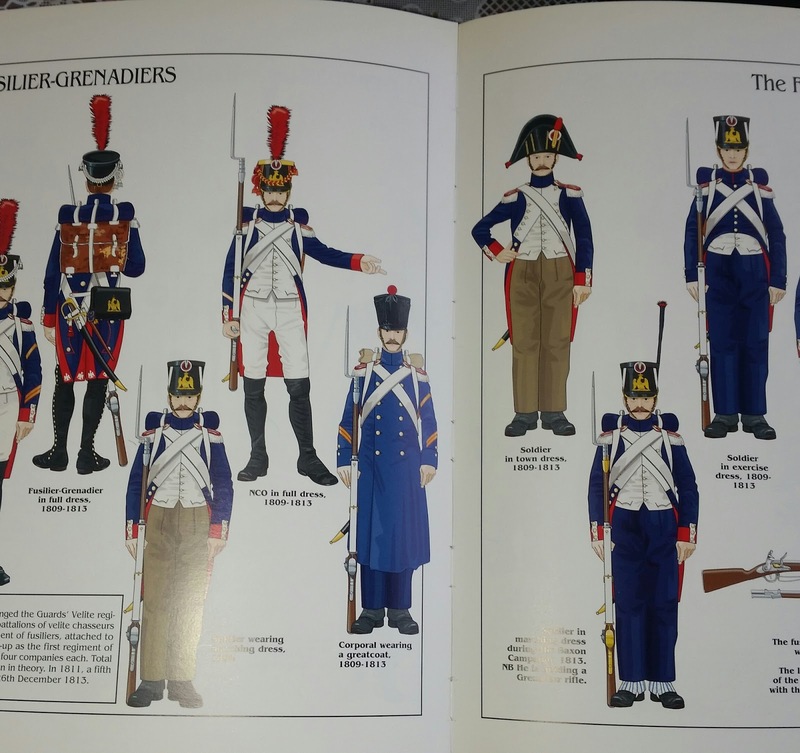 The French infantry can include a stand of 3 skirmishing Voltigeurs out in front of the main formation in a Mixed formation. 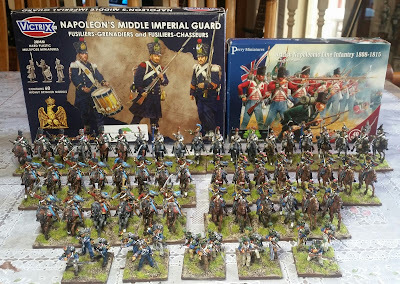 I plan to build 3 units of 16 figures each from the Middle Guard box. Interestingly, the box comes with Old Guard Grenadier and Chasseur bearskin heads as well as covered shakos for Middle or Young Guard. 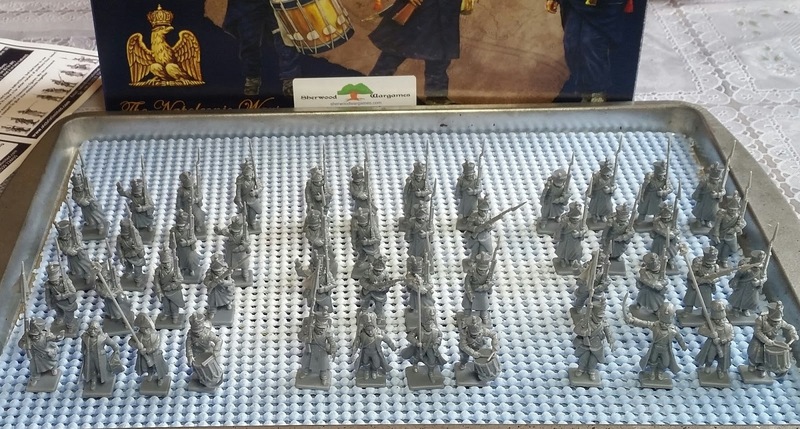 I noticed the gray plastic for this Victrix set seems sturdier than the earlier yellow plastic sets; particularly the bayonets. So much talk for now - there's a lot of gluing to be had. Thanks for stopping by and best regards to all. As it happens, no sooner our annual big convention, Enfilade! is over, I'm already starting to think of next year's games. 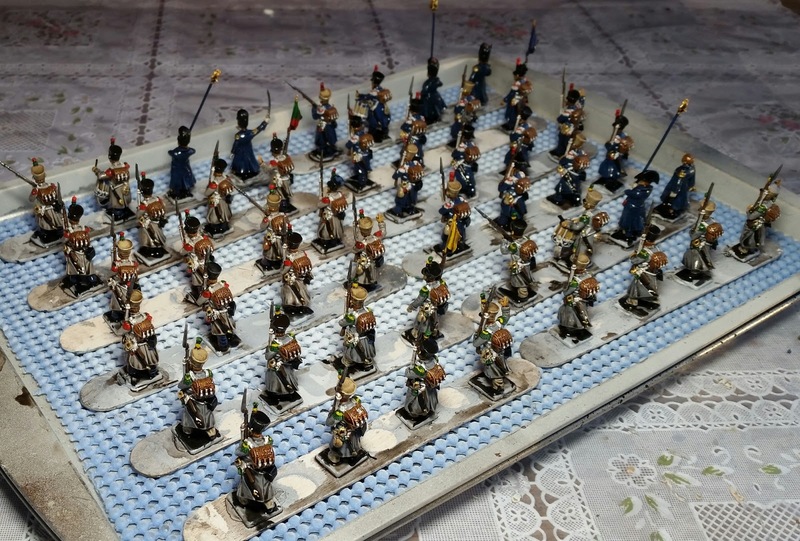 Looking into my cabinet, I noticed my remaining Napoleonic figures - mainly Victrix and Perry plastics - hadn't been on the gaming table since 2012. I'm still deciding what rules to use, but whatever is decided upon will be quick play for convention players. It may be either a version of Lion Rampant or a modified/simplified version of Black Powder. 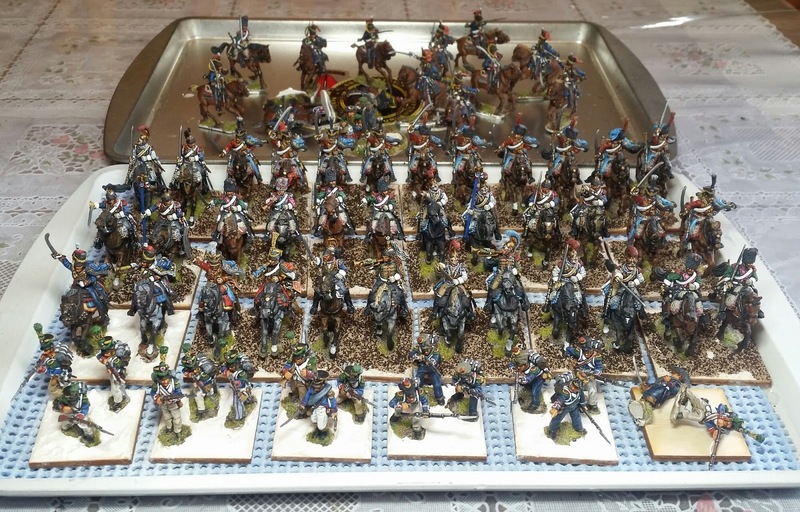 In any case, I wanted the cavalry to be on 50mm squares; they were previously singly-based. The French skirmishers were based 4-figures per 40mm squares, but have been re-based 3-figures per 40mm, like the British Rifles already had been. I ran out of 50mm squares so am awaiting the arrival of more from Litko to complete the KGL Hussars. 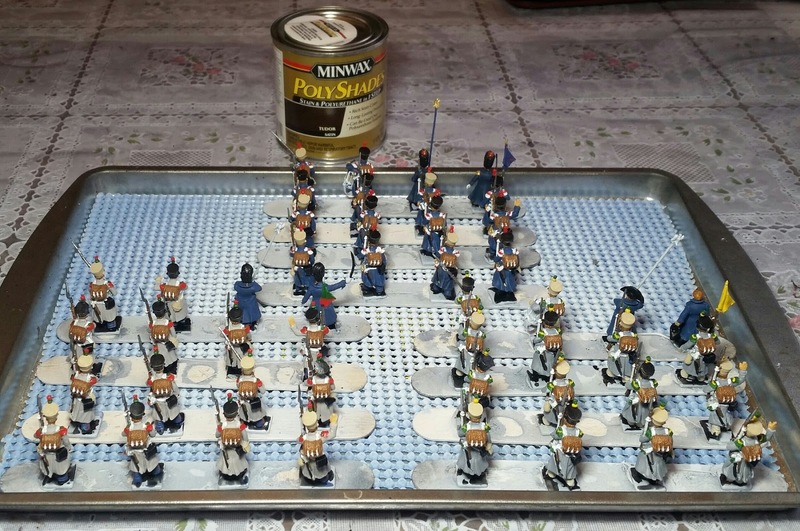 As normal for me, the figures are plopped onto the bases using acrylic caulking. I also need another Voltiguer figure to complete the last stand. They'll be used in units of 6-figures each . Thanks for stopping by and best wishes to all.